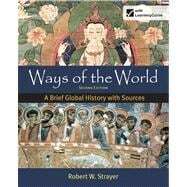 Ways of the World is one of the most successful and innovative new textbooks for world history in recent years. This 2-in-1 textbook and reader includes a brief-by-design narrative that is truly global and focuses on significant historical trends, themes, and developments in world history. Author Robert W. Strayer, a pioneer in the world history movement with years of classroom experience, provides a thoughtful and insightful synthesis that helps students see the big picture. Following each chapter's narrative are collections of primary written and visual sources organized around a particular theme, issue, or question so that students can consider the evidence the way historians do. The second edition rolls out Bedford/St. Martin's new digital history tools, including LearningCurve, an adaptive quizzing engine that garners over a 90% student satisfaction rate, and LaunchPad, the all new interactive e-book and course space that puts high quality easy-to-use assessment at your fingertips. Easy to integrate into your campus LMS, and featuring video, additional primary sources, a wealth of adaptive and summative quizzing, and more, LaunchPad cements student understanding of the text while helping them make progress toward learning outcomes. It's the best content joined up with the best technology. Also available in number of affordable print and digital editions, including an edition without sources. Robert W. Strayer (PhD, University of Wisconsin) taught African, Soviet, and world history for many years at SUNY College at Brockport, where he received Chancellor’s Awards for Excellence in Teaching and for Excellence in Scholarship. In 1998 he was visiting professor of world and Soviet history at the University of Canterbury in Christchurch, New Zealand. Since 2002, he has taught world history at the University of California, Santa Cruz; California State University, Monterey Bay; and Cabrillo College. His scholarship includes work in African history (Kenya: Focus on Nationalism, 1975; The Making of Mission Communities in East Africa, 1978); Soviet history (Why Did the Soviet Union Collapse?,1998; The Communist Experiment, 2007) and World History (The Making of the Modern World, 1988, 1995; Ways of the World, 2009, 2011). He is a long-time member of the World History Association and served on its Executive Committee.